That’s right – a friend of mine is launching his own brilliant book tomorrow and is aiming to reach Best Seller status! 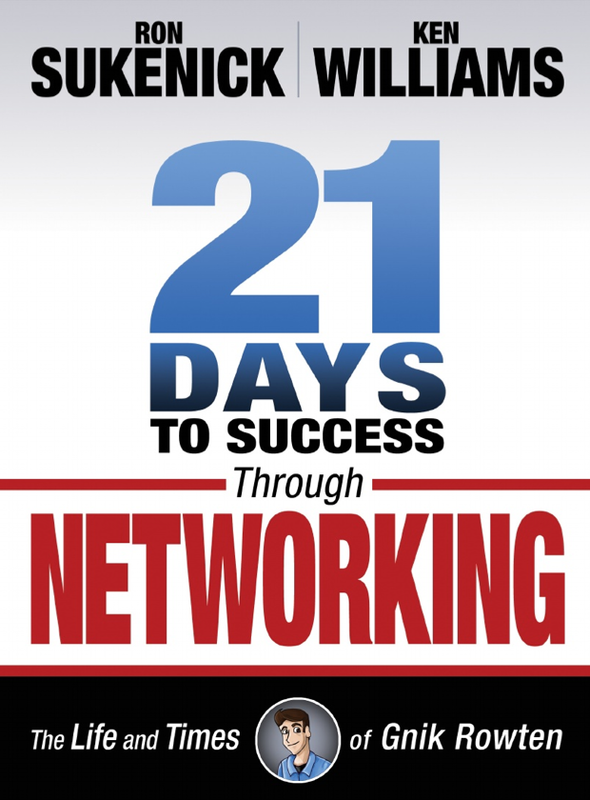 His book ‘21 Days to Success Through Networking‘ is written as a novel but enlightens the reader with 21 valuable insights on how to not only strengthen existing relationships but create new meaningful and powerful ones too. It launches tomorrow so CLICK HERE to learn more about the book and the gifts being offered. I’ve seen the list of what’s being offered and know how useful and helpful they will be to anyone interested in building lasting relationships for personal reasons or business ones. Are you part of the throw-away culture? This is September 29th of my book: ‘How To Change Your Life One Day At ATime‘. Take the opportunity today to Reuse something. The three ‘R’s of the sustainable world are: Reduce, Reuse, Recycle. Today look around you and think what you or someone else might be able to Reuse. In fact do not throw anything away today without considering how it might be Reused in some way. Do this often and before you know it you’ll habitually think of how to Reuse stuff and you’ll have helped the planet in some small way. The simplest way to create joy in yourself AND others! This is September 28th of my book: ‘How To Change Your Life One Day At ATime‘. Take the opportunity today to remember the nicest thing someone ever did for You. This might get your brain box going or you may be a very fortunate person and have a plethora of memories. Whichever, remember the occasion, remember where you were, what you were doing, then what did someone do. Now recall how you felt about it. If it stuck with you it must have made quite an impression. Enjoy remembering every detail about that experience. Now send a thank you message to that person reminding them just how their action affected you. Send a letter or an email or a text or a video of yourself saying thanks. Finally, think about how you might be able to do something really nice for someone else. Think of how it may make them feel. How to implement the ‘Butterfly Effect’. This is September 27th of my book: ‘How To Change Your Life One Day At ATime‘. Take the opportunity today to remember the nicest thing you ever did for someone. If you’re a half way decent person you probably found that quite hard as you trawled through dozens of memories trying to find the nicest one. You see trying to figure out what the nicest thing was is impossible because you can’t know how you have affected someone when you do something nice. At the time they might just say ‘Oh, thanks for that.’ and you don’t hear any more, but unbeknownst to you that thing turns out on reflection to be massively influential for that person. So what you think is the nicest thing may well be pretty good, but it might pale in comparison to something else you did that seemed quite small. So the point of the guide? Do nice things all the time no matter how small they are because you don’t know the long term effects of that action. What do you think coincidences actually are? This is September 26th of my book: ‘How To Change Your Life One Day At ATime‘. Take the opportunity today to follow a coincidence. When you experience a coincidence ask yourself why you noticed it? We’ve all got a different take on what a coincidence is. Some think it’s divine intervention. Some think it’s luck. Some think it’s just one of a million coincidences that are happening every day. I believe in the last one but it doesn’t matter which you believe. If you want to take something from it, if you want to make it a useful experience – ask the question above. Find meaning in it. You may have to assign a meaning to it. Whatever, just find a meaning. Do that every time you experience a coincidence and you may find that those meanings start to add up to something. “Recent experiments have shown that living organisms can evolve quickly to adapt to changing environments. Environmental stress can trigger a response which speeds up the cycle of reproduction while making the reproduction of genetic material “deliberately faulty” in such a way as to generate mutations which may prove a better fit to the new environment. This backs up Stephen Jay Gould and Niles Eldredge’s theory of punctuated equilibrium, which views evolutionary change as something which happens in bursts with long periods of stability. It also shows that Jean Baptiste Lamarck’s original theory of adaptive evolution is at least as relevant as Darwin’s and Wallace’s later theory of natural selection to a complete understanding of the evolutionary process. PS: BUY a copy of MY book right here on Amazon: http://amzn.to/1ahfW7R (you’ll see my listing right at the top – it’s the cheapest place to get copies at the moment and YES they’re brand new AND signed). How much do your surroundings affect your mood? This is September 25th of my book: ‘How To Change Your Life One Day At ATime‘. Take the opportunity today to notice your surroundings. We spend most our time virtually blind to our surroundings because we’re immersed in them most days. Leave a book on the stairs for a few days and you stop noticing it’s there. We get used to what we see every day and therefore have no need to notice it. Now imagine you go to a new place, a holiday, a theatre, an open space. What do you do? You spend time taking it in. Absorbing the detail. Noticing the details. Exploring the experience of it all. It feels great doesn’t it? It’s how we enjoy, by noticing. Spend today re-noticing your surroundings and you’ll re-enjoy many aspects of it. We like enjoying things, we can enjoy more if we notice, so let’s notice more often. One other thing… when you take notice of your surroundings you may just get around to picking that flipping book off the stairs! PS: BUY the BOOK, OR someone else, get a copy of my book right here on Amazon: http://amzn.to/1ahfW7R (you’ll see my listing right at the top – it’s the cheapest place to get copies at the moment and YES they’re brand new AND signed).